Imagine blowing through a long tube that’s ice cold. The air that enters the tube is the same temperature as your body –about 98 degrees or so. But the air that leaves the tube is a lot colder, thanks to the tube's frigid temperature. You can warm up the air that leaves the tube, but only by blowing through the tube for a long time, until the tube itself becomes a lot warmer. Many forced-air heating systems have to blow heated air through ductwork that's really cold. When your ductwork is located in an unfinished attic, basement or crawl space, the duct temperature will be the same as the temperature of these spaces. So your heating system has to spend time and energy heating up the ductwork before it can heat your living space. On hot summer days, the problem occurs in a different way: Air that has been cooled by your central air conditioning system ends up being heating by the ductwork. Of all the energy-saving upgrades that can be performed on a house, duct insulation is one of the most affordable. Ducts can be insulated in different ways. Sometimes a foil-faced blanket is wrapped around the duct. In other cases, a duct run can be insulated with spray foam. A third option (with attic ductwork) is to add enough extra attic insulation so that the ducts are completely covered with the new insulation. A good way to determine which strategies work best is to have an energy audit performed on your house. Home energy experts recommend that ducts should be sealed as well as insulated, and it's very cost-effective to have this work performed at the same time. 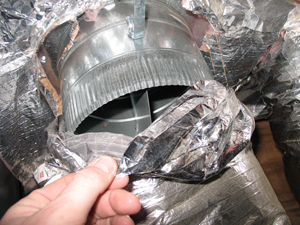 Ducts are inherently leaky, because of all the joints between duct sections and fittings. Energy is wasted when conditioned air leaks out of ducts, and when unconditioned air leaks in. Leaky ducts also create indoor air quality problems by drawing attic, basement and crawl space air into the air supplied to the living space. Take the experts' advice and make sure that you have duct sealing and duct insulation performed together. We are a locally owned and operated company proudly serving New Haven, Bridgeport, Hartford, nearby Stamford, Waterbury, Norwalk, Danbury, New Britain, West Hartford, Bristol, and the surrounding areas. To schedule an appointment, contact us by phone or e-mail today!